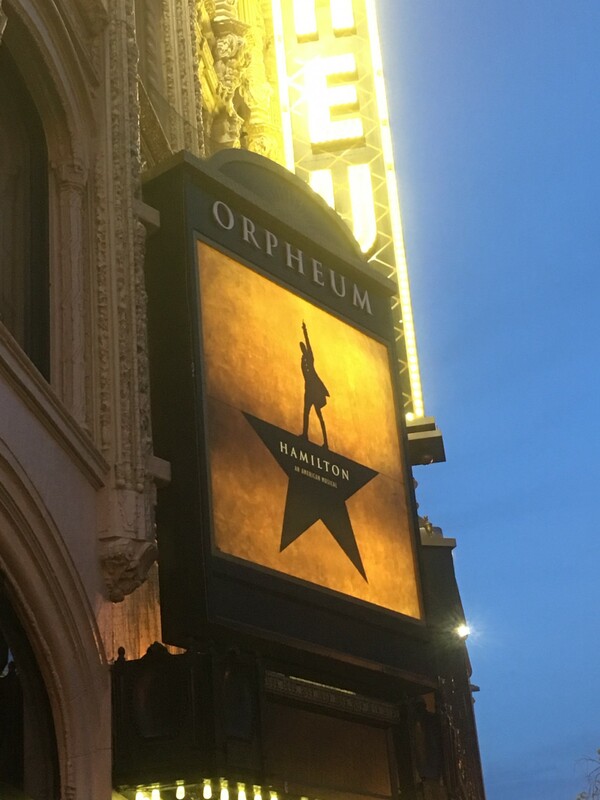 It’s not inaccurate to say that I had a minor emotional breakdown this week in the middle of (OMG I FINALLY got to see it) Hamilton. Our household is full of music, and Hamilton’s cast album has been on repeat since it came out, so it’s no surprise that on a sheer aesthetic level, the show captivated me, as its music already has both of you. The application of torch songs, the overt and subtle hip-hop references, the costumes and set…as so many have said, it’s a masterpiece. But I’ve seen artistic brilliance before. This time, there was so much more. I hope that someday, when I try to explain to you why the experience was overwhelming for me, you’ll roll your eyes, because the America you know will no longer resemble the one I describe. How do I explain to you how moved I was by the sight of all of those beautiful, beautiful black and brown bodies on stage depicting the founding of our nation? How the resulting illumination of the oft-hidden history of their ancestors brought me to tears? How the inclusion of the idea of slavery as a foundational element of the nation, the acknowledgment of the restrictions on women, the nod to immigrants- how the whole thing was a paragon of intersectionality? And then how do I explain why that’s exactly what I found so hard? Hearing the soundtrack was one thing. But actually witnessing the power of that cast, singing those songs, about those people…I wasn’t prepared for it. I couldn’t help but contrast the United States depicted onstage (at the literal, theatrical, and meta levels) with the actual United States as I’m currently experiencing it. I live in a country where racism remains a foundational element of society. Women are still restricted, both legally and culturally. And the immigrant experience these days feels like something out of a horror movie. Or a Western. We were onto something as a nation; we really were. And now it feels like all of that progress- all of the movement we had made towards a world that resembles the experience of Hamilton- has been undone, in a few short months. I take comfort from the sheer popularity of Hamilton. We are still a country where such a thing can be made, and celebrated. I take heart from the realization offered by the show that our country has been through worse, and survived, in no small part because of the actions of a handful who refused to bow down to myopia and partisan politics. We can do this again. We will do this again. I just hope we do it in time for you to roll your eyes when you read this, years from now, and laugh at your mother for worrying so.